It’s summer and I want to be outside playing with The Five-Year-Old. While that doesn’t mean I’ve stopped reading, it does mean I don’t want to spend a lot of time reviewing. Hence, the book review short. 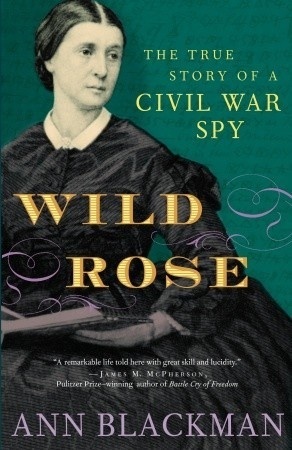 Wild Rose tells the story of Rose O’Neale Greenhow, a woman whose beauty, romantic intrigues, and social prominence in Washington, DC during the Civil War made a nearly perfect Confederate Spy. An intimate friend to John C. Calhoun, James Buchanan, and Dolley Madison, Greenhow used her connections to obtain critical — and accurate — intelligence about Union activities during the War. Information that she would then pass on to General Pierre G. T. Beauregard. One of her coded messages to Beauregard arrived at a critical time during the Battle of Bull Run, ultimately enabling the Confederacy to prevail in the encounter. As Blackman says, it was a brilliant piece of spycraft, even if it was the reason Allen Pinkerton finally caught up with her. If you’re expecting the story of a woman straight out of Alias, go elsewhere. Spycraft in the Civil War simply wasn’t that advanced. Measured against our current standards, Rose Greenhow wasn’t so much a spy as an extremely well-connected woman who was a very determined correspondent. Still, her biography is an interesting read if you enjoy Civil War history. Previous The Five-Year-Old Reviews Books: Dragons, Knights, and Brains, Oh My!